Back in August of 1992 I was playing a friendly game of volleyball on a sand court at my mom’s company picnic in Charlotte, NC. The CEO gave me a beautiful set from the back line which I proceeded to spike into somebody’s face on the other side of the net, scoring the point in the process. And really, that’s the important part of the story – I won the point. Unfortunately on the way back down to the ground my femur decided to explode at the knee joint. A week later I was having my first major surgery on my knee to pin everything back together and try to reattach all the tendons and ligaments that were damaged in the trauma. Three months on crutches and 6+ months of physical therapy humpty dumpty was back together again. Everything was okay for about 8 years and a move to Seattle, but then I started having my knee dislocate on rare occasions with no major impact or event. I would be standing and talking to someone in the office, turn to leave and wham-o. At first it was once or twice a year … then once a quarter … then monthly, weekly, … you get the picture. So in 2001 I had my second major surgery – a patellar realignment. Essentially my kneecap was not in the right place so the doc went in and cut the patellar tendon off the bone on my lower leg and reattached it in a better spot (about 1.5cm to the inside) with a couple screws. They also shortened a few tendons to try to pull it further into the right spot. Another 5 months later (my last physical therapy appointment was the morning of 9/11) I was good to go and my knee was stable. Over the next 5 years my knee was mostly okay, but by 2006 there was a lot of grinding a swelling in the joint causing some pain. So I had arthroscopic surgery to “clean out” the built up scar tissue and smooth out the surfaces in a knee that was already starting to see some moderate arthritis buildup. Unfortunately when all was said and done this procedure really didn’t seem to make much difference for the quality of my knee pain and comfort. What’s worse is we discovered that the tendons that were supposed to be pulling my kneecap into the right place had “released” that adjustment. So tomorrow morning I’m having surgery … again. My kneecap will essentially be disconnected and then screwed back in at a different spot and I’ll have a ton of work done inside the joint to clean things up and adjust the tendons. I’m looking at a month or so in a big leg brace and on crutches, then months of PT. My hope is to blog about this experience so other folks know what this is like. I’ve done a lot of looking online and there are not a lot of good resources (I’ve found) on what a patient should expect from this ordeal. Should be fun – for you, not for me. I’ll start out with a picture … we’ll call this one “Before”. I’ll try to post “After” tomorrow. You can see how much swelling is in my knee – and I’ve been sitting on my recliner with my leg in this position pretty much all day. The scar on the outside (left) of my knee is the original surgery from 1992. The one on top is from 2001. 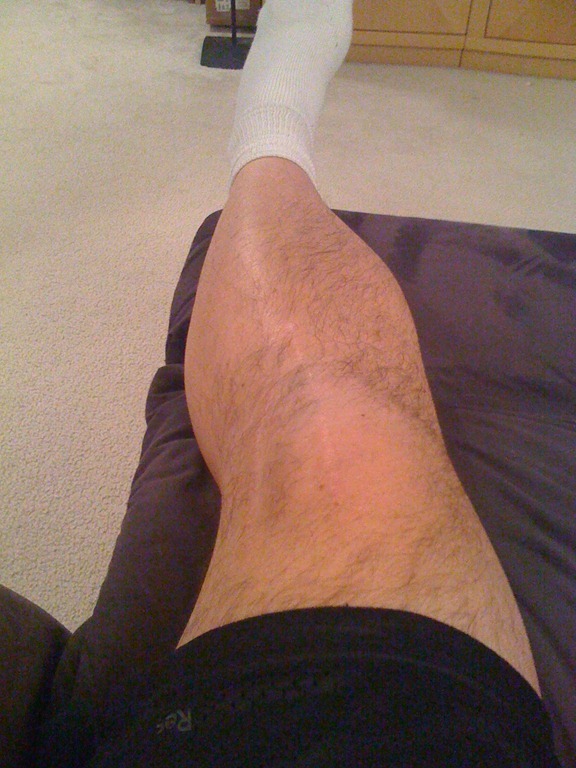 The theory is that the doc will use the 2001 line for another incision tomorrow – have to keep my legs pretty you know. Mair, I’m going to be working on a blog post today. You can also follow me on http://twitter.com/nanovak as I’ve been putting short updates there. I’m having complications because of how many surgeries I’ve had on my knee, so I have a lot of pain from a hematoma that developed in my calf (pool of blood) and associated swelling. The knee itself is actually doing very well and as expected. If I didn’t have the hematoma to deal with I would be mostly independent at home by this point and would be working from home this coming week.